Joy Creek Photo Archive (c) all rights reserved The leaves of Cyclamen hederifolium are marbled in light and dark green. They are somewhat triangular in shape, with wavy edges and purple reverses. 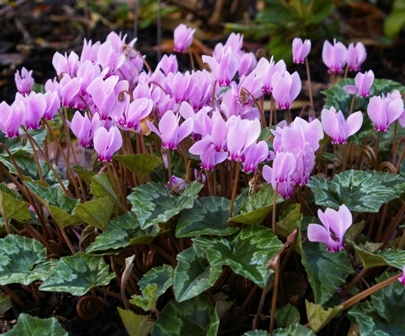 The solitary flowers rise on short stems in the autumn before the leaves develop. They disappear but the leaves persist throughout the winter filling a very important role in the winter garden. We grow these under conifers and rhododendrons. A Great Plant Picks selection.